I am always a little mortified when I hear of the existence of new Coldplay music. It's a mounting sense of dread that has nothing to do with disappointment or disgust, but everything to do with painful nostalgia. I thought that if I just refused to listen to "Every Teardrop Is A Waterfall," the lead single on their as-yet-untitled fifth studio album, it might disappear. It has never really occurred to me that I should have a favorite band. Yet if I did, Coldplay is an obvious candidate. I've been listening to them since I entered high school. I've bought their albums and DVDs, and hunted down their demos and b-sides. I racked up several hundred posts on their official message boards. I attended their 2005-06 "Twisted Logic" tour on both coasts. But if you pressed me for my all-time favorite band I would say The Clash or LCD Soundsystem or even the goddamn Electric Light Orchestra. And I would be lying to you. Yes, there's a very simple reason that I've been ignoring "Teardrop" - I was terrified that I might like it. The irony of the song's title is that while it's true to those for whom sensitivity can be measured in drops, it was written by men who measure theirs in oceans. Other leaked song titles from the new album include "Hurts Like Heaven" and "Us Against the World." Coldplay is aiming to be either the Cure without the makeup or the Smiths without the intense anger and despair (Chris Martin has lots of emotions, but doesn't seem to pay attention to his meaner ones). 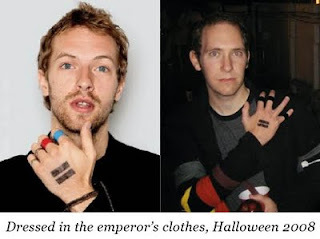 To say that Coldplay now seems to be inviting ridicule is to have not paid attention for the past 7 years. What was once defensible about the band is just as easy to skewer these days. They turned down every request to use their music in advertising - including Gatorade's pitch for "Yellow," which probably robbed us of a terrifying/legendary spot fetishizing the brilliant hue of the neon piss-colored jock fuel - until teaming up with Apple to sell iPods via "Viva La Vida." Martin's political activism, while well-meaning and sincere (Coldplay is perhaps the world's only non-Christian rock band that tithes 10 percent of their profits), has grown clumsier with higher levels of fame. It's the Bono Conundrum: a rock star has a more difficult time convincing us that he's for the people when he's not of the people. When I finally gave "Teardrop" a chance, I didn't have much of a reaction. I researched a bit and discovered that it samples "I Go To Rio," a Peter Allen song that is a part of a late-1970s microgenre I like to call 'travel brochure rock' (which includes the "Pina Colada Song" from Rupert Holmes' underrated Partners in Crime and Pablo Cruise's Worlds Away, which closes with their cover version of "Rio"). This is incredibly unfair. I never imagined that Coldplay's next step would involve exposing my cooly detached love of 70s soft rock for the nerdy obsession that it really is. They are not just bruising my ego's soft underbelly - they are ramming a stake right through it. I've listened to Coldplay speak to us - literally - through their music for nearly a decade. Parachutes and A Rush of Blood to the Head were quixotic, dreamy records that gave me enhanced powers of romanticism and bad poetry. They started to lose me with X&Y and their newfound determination to fix us and comfort us and maybe even tie our shoes and take out our trash if we were feeling too heartbroken to do it ourselves. The bombast was reined in to great commerical effect on Viva la Vida or Death and All His Friends. And if your album title is that much of a mouthful and has a Delacroix painting on the cover, then the music better be moving some units. But it's why the music is moving me that's most frightening. Coldplay was the soundtrack to awkwardness, insecurity, remorse, disappointment, narcissism - every type of feeling that was difficult to discuss was put out in public and on the radio. How can you justify your melancholy when it's perfectly reduced to a four-minute pop ballad? It's no wonder that the thought of loving Coldplay makes me uncomfortable. They have been calling me out for years. I give up, guys. You've fixed me.